Thank you to all of you who sent me emails letting me know that my comment section wasn't working. I missed hearing from you and I'm glad that everything is working now. Let me know if there is anymore glitches and thank you for the kind comments on the new blog look. The change has been similar to redecorating a room and I've been having a lot of fun with it! 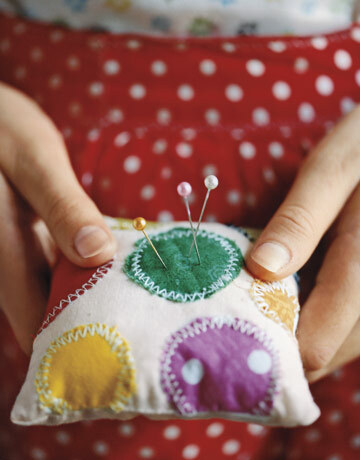 and moving to a simple yet fun and decorative pincushion. They have directions for each item and most items are very simple to complete. I think this curtain tie-back made from buttons is so pretty. Wouldn't this look lovely in a bedroom? This doily vase is made using a clear glass vase with doily wrapped around it and stitched down in a few strategic places. The possibilities for this are endless. Think of all the colors of doilies and all the vase shapes. There is not a seamstress out in the blogosphere that doesn't have scrap fabric and buttons. 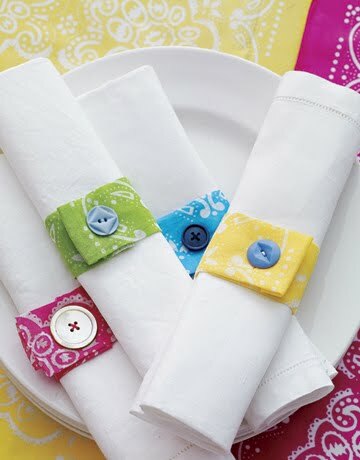 What a fun and colorful way to make napkin holders. This project is one of my favorites. A simple pair of flats, some satin ribbon and a glue gun. It doesn't get much easier than that. Be sure to check out the other craft ideas and let me know what you create! I do love your new blog look. Was it done by the same person who did your last one, because I loved it too. Didn't know about the Country Living website. I will check it out. Gonna try those napkin rings for an afternoon tea I am having for a friendns birthday on Sunday. Thanks for the link. Loved all your handmades in the last post. Glad you got everything working now. Love the shoes! A couple years ago I bought a pair of red shoes and a length of red ribbon with white polka dots to make these. And I never put it all together! I just may get this one going; thanks for the reminder. Hello sunshine, your background is making me so so happy! 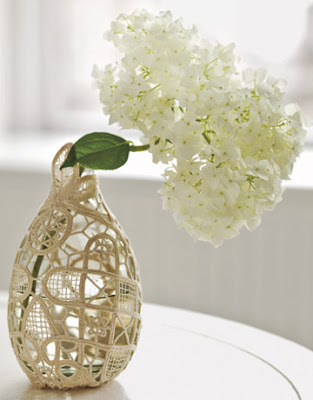 The doily vase is so lovely. Great idea! 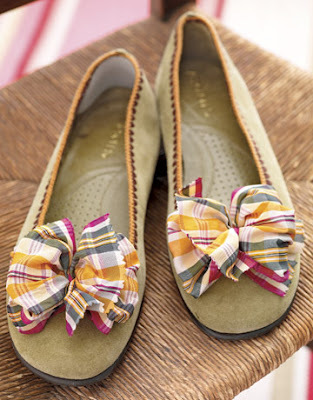 How cute r those flats? love em! Now im off to check out country living. Have a beautiful day! Your new blog design is BEAUTIFUL!!! I love it! What was the deal with you comments section? I'm glad that you figured out what to do! I love this post, such great ideas, and pretty too! Your new look is just Beautiful!! I tried several times to leave a note yesterday and thought the troubles were on my end. :o) So glad it is all sorted out for you. :o) Your crocheted items are just precious as well as the other sentimental items you have. I decorate the same way, meaningful items from special people. :o) And pictures, lots of pictures! Your new look is beautiful! Michelle did my blog too. She is such a joy to work with, especially with a computer illiterate like me.LOL! PS So glad your comment do-hicky got fixed! Renee- i love your new blog look so adorable!!! i also want to say thank you for being such a wonderful guest blogger for me while i was away. i loved your post and i love that shop!! i am so excited about you coming here with Joyce for the barn sale. We will have a great time. Your blog looks beautiful, Renee! Really, really pretty and easy to read! I love the Country Living website too...especially their craft section! I added your blog to my "blog scroll" this morning and was thrilled to see my blog on yours. Thanks so much! I am one of your followers too so I will indeed be keeping up to date with all of your posts! 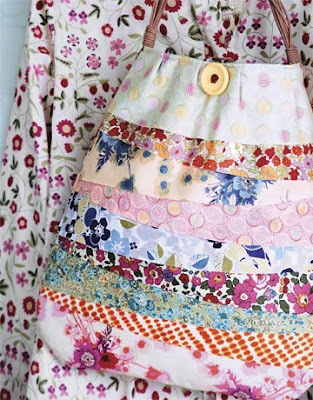 These projects all look too cute, and do-able! And your blog is adorable, it looks like your style, love it! Hi, I'm not really sure how I ended up here. ;-) You know how that goes. I couldn't help notice that we have a TON of things in common. I am currently in another Beth Moore study. Love her. I'm not really a quilter. Have planned several, finished none. I'm a knitter. I made cupcakes today to practice for a Women's event we're having at church in two weeks. I blogged about that yesterday. I think practicing is a good thing, especially when you're trying something new. I love the quilt fabric colors your daughter picked out, the Country Living bag is my favorite, and I'm a big Amy Butler fan. I'm going to be back!